Talygen is the most advanced Business Management Automation package in the industry today. Companies can run their entire business using Talygen. Processes and workflows that previously had to be managed manually or via individual software applications can now be managed via Talygen. This application is an amazing product for any business organization, big or small. Business owner scan manage every aspect of their business, employees, contractors, and customers. Talygen’s has helped change the way Business Owners and Managers communicate with their Employees and Clients. Talygen offers advanced features that are not available anywhere else in the marketplace. With Talygen this entire suite of advanced business productivity applications is available, fully integrated, in just one easy to use application. Talygen is a Cloud based SaaS web application with a very easy to use touch friendly interface and easy scalability. There is no other Business Management Automation application with Talygen’s advanced features and rich customizable work flows. Talygen currently has 20 fully integrated modules that communicate with each other and those modules include: Time Tracking, Project Management, Expense Tracking, CRM, Ticketing, HR, Hiring, Human Capital Management, Desktop Auditing, Cloud Storage, Message Boards, Built in Chat, Invoicing, Knowledge Bases, Document Sharing, Performance Review, Event Management, & Client Module. Talygen has been designed specifically to make managing your business a straightforward and uncomplicated process. Our primary objective is to deliver productivity that our Clients and Users cannot find anywhere else. With its extensive set of features, easy to use concepts and enhanced functionality, it allows you to overcome the common hurdles and hindrances that plague every business Talygen is easy to setup. There is no need to install any extra software. With a browser and an internet connection, your Business is ready to go. We provide an unmatched, easy to use and innovative solution to our Users that gives them an extra edge. Talygen licenses are per user per month, with discounts for large enterprises. There are no annual contracts and you can cancel anytime. There is also no setup fee. Talygen is the only application that allows companies to have a complete insight to their business on a daily basis. Talygen has an integrated smart engine that analyzes data and predicts problems allowing you to make smart decisions that affect the bottom line. Talygen has created a predictive data engine that finally allows companies to proactively manage their business. 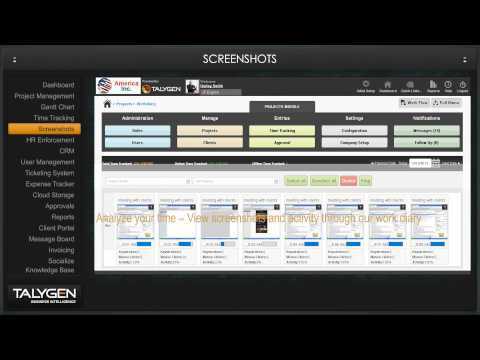 Talygen is an enterprise app that was built from the ground up to support multiple verticals. This single application lets companies manage their entire business, including processes, relationships and workflows. Talygen has created and launched an entire purpose built & integrated cloud app and platform, with 20+ verticals. It has built a full eco-system that is available in 12 international languages, has mobile apps in iPhone, Android, Windows Phone and BB, has desktop add-on apps in Mac, Windows and Linux and integrations to QuickBooks, Chrome, Concur, Basecamp, and Freshbooks. Talygen is available to everyone in the office or on the go. Most cloud app vendors are now moving to either add more verticals or integrate with other cloud apps. Integration brings a whole new set of challenges, including using third party connectors or writing custom code. Neither work very well as most of them will only transfer data and not the business rules. In most cases data has to be entered repeatedly across various apps. This leads to frustration and "app abandonment". Talygen has now elegantly solved the problem of disparate and mostly incompatible single vertical cloud apps by offering a purpose built integrated cloud app and platform that is poised to revolutionize the cloud app space. Many customers are able to replace many different Enterprise cloud apps with Talygen, saving them over 80% in costs. Below are some frequently asked questions for Talygen. Q. What type of pricing plans does Talygen offer? Q. Who are the typical users of Talygen? Q. What languages does Talygen support? Q. Does Talygen support mobile devices? Q. Does Talygen offer an API? No, Talygen does not have an API available. Q. What other apps does Talygen integrate with? Q. What level of support does Talygen offer? Q. Which apps is Talygen compared to most often?